The MOBO awards have announced their nominations for their twenty first anniversary show in Scotland - and Craig David, Kano and Wiley are just some of the names who could be popping up at the bash. The awards take place in Glasgow's SSE Hydro on November 4 with Chase & Status already confirmed to perform on the night. Organiser Kanya King MBE who launched the bash in Ronnie Scott's London said: "It is unbelievable it is our twenty first anniversary show. 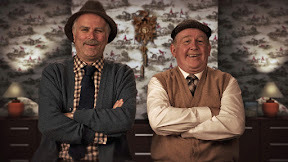 This year's show will be broadcast on the night on ITV2 then later ITV and we can't wait." 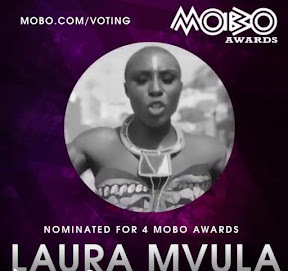 The nominations list for the show is led by Kano and Laura Mvula, who are up for four MOBO Awards. Abra Cadabra Feat. Krept & Konan "Robbery (Remix)"
General tickets for the 2016 MOBO Awards are ON SALE NOW – ticket prices are £25, £35 and £45 plus handling charges. For VIP tickets, please contact us via viptickets@mobo.com. 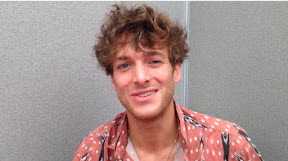 PAOLO Nutini will bring in the bells at Edinburgh's Hogmanay for his only festival performance this year. 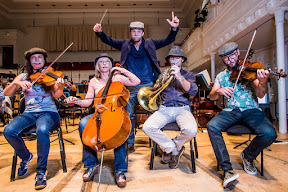 The Paisley born multi platinum performer is celebrating the ten year anniversary of is album These Streets and can't wait to get the party started at the flagship Concert in The Gardens. 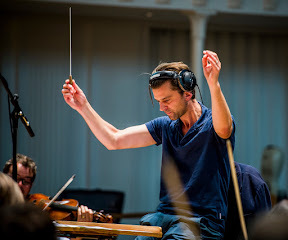 He said: "When they offered us the gig, I was made up, as it was 10 years ago that we had shown up at the castle, lined up to play alongside the Pet Shop Boys and unfortunately it was a washout ... forcing the powers that be to cancel. We went back as a three piece in ‘08 to play a small set before legging it to Glasgow for George Square but this now gives us a chance to make up for lost gigs. We had no plans for any shows this year after Wales but this was the only one that over the years I hoped that we would get another shot at. Edinburgh is electric at that time of year and I'm glad we get a chance to be a part of it. Let's dance ladies and gentleman." Paolo will join The Charlatans who play The Waverley Stage at the fest alongside another as yet unannounced special guest. The Castle Stage at the fest features performances from leading Scottish Celtic crossover bands Salsa Celtica , Manran and Ross Ainslie, Ali Hutton & Friends while The Frederick Stage (Party) provides the soundtrack to the whole Street Party with a heart-thumping, show stopping, disco dancing set featuring DJ’s, dancers and performers from Guilty Pleasures. VJ’s Buttercup and Pixels mix cutting-edge visuals to accompany the dance tunes which are relayed on seven screens along the length of Princes Street and throughout the Street Party arena. The Mound Stage programmed in collaboration with the Edinburgh Jazz & Blues Festival hosts James Brown is Annie, Brass Gumbo and Blues n Trouble. The Candlelit Concert will take place in the magnificent setting of St Giles’ Cathedral. SOCCER superstar Pele has spoken for the first time about his new marriage - admitting it was about time he made the commitment. The greatest player of all time was appearing at a swish dinner and Q and A in Glasgow's Crown Plaza hotel when one of the guests congratulated him on his recent nuptials. Pele who married his third wife 50 year old Marcia Cibele Aoki in July replied: "I felt I needed to fix something. After five years it was time to be done." He added: "We are very happy." The two lovebirds got together in 2010 following a chance meeting in a lift in São Paulo when Marcia invited Pele to see a home renovation she’d done. The two had planned to marry a couple of years ago but the ceremony had to be postponed after he suffered health problems. Pele truly made his mark on his Scots fans during his flying visit. He also made dreams come true for sick kids from the Les Hoey MBE Dreammaker Foundation after inviting them to meet him. 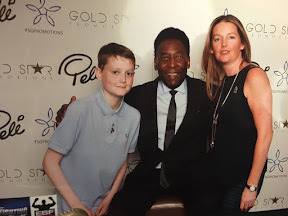 Kai who was with his brother Sean said: "It was brilliant meeting Pele. 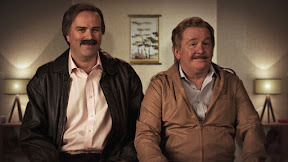 He asked me what position I play and I told I'm I was a striker." Mitchell who hasn't been able to play as much football since being diagnosed a year ago said: "It was amazing. He's such a legend and we talked about football and how he scored goals." And Michael smiled: "Pele told me to kill the goalie." His mum added: "Michael has just finished his treatment after three years and this is a brilliant way to finish it. 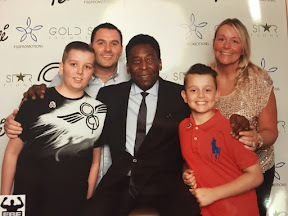 Pele was lovely and Les did a great job of getting us all to meet him." 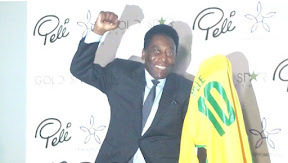 SOCCER superstar Pele was left in shock after a competition winner at his private dinner in Scotland turned out to be one of his opponents in the sixties. 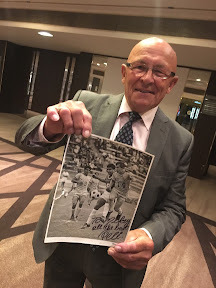 The Brazilian legend was left grinning from ear to ear after seventy one year old Mickey Walker presented him with a photo of them both playing a match in the 1960s at the bash in Glasgow's Crown Plaza. Pele remarked: "He told me he used to play against me. I thought he was joking. He kicked me a few times." Doncaster lad Mickey who now lives in Scotland part time did indeed used to play against Pele - twice as a striker with the Los Angeles Wolves North American soccer league. 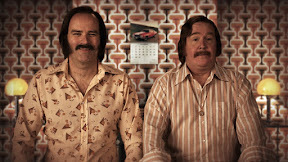 He said: "I couldn't believe it. I just brought a picture of me with him and didn't expect to meet him like that. We played twice together - once in LA and the other in New York. The picture I have is when we played in Los Angeles at the Rose Bowl in 1968. The score was four two to Los Angeles and I got one, the third goal." At the New York match we lost four two and Pele scored two and was magnificent. I also played against Vava, Peles playing partner in Brazil in San Diego and in Los Angeles." Mickey brought the photo with him on the off chance he might meet the veteran champ. He said: "He's the worlds greatest player, better than Messi." 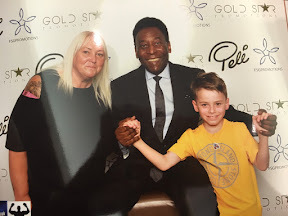 When Pele told me I'd kicked him I knew I wasn't the only one. It was the only way to stop him playing. I wasn't a dirty player but that's how you did things then. It was a tough era and he was one of the toughest." These days the game has gone soft and you're not allowed to spoil the actual theatre. If Pele was playing today with non contact tackling he'd probably be able to score more goals than Messi and Ronaldo put together." Pele spent a good few minutes catching up with Mickey and was as shocked as he after Mickey won a painting of him during a game of Heads and Tails. Mickey said: "He couldn't believe a player from his era was in the audience. He hasn't really changed physically and looks very good for his age. I'd like to think he remembered me too but you never know. I'm still shaking. He put a wonderful finale to my years as a coach manager ambassador and player of football and it's a privilege to meet him socially."